Don’t know which formats, codecs are supported by Plex for Apple TV? Is it possible to play ISO image files on Apple TV 4 via Plex? In this article, you can get the solid answer. Well, when you get the Plex for Apple TV, you may wonder which formats, codecs are supported by Plex for Apple TV. Get teach support from Plex, we know that the Plex for Apple TV app supports direct play of video in the MKV, MP4 or MOV container with the H.264 or mpeg4 video codec, and either the AAC, MP3, or AC3 audio track. It can also direct play audio in MP3, and AAC (in the MP4 container). If you have some other unsupported files like ISO image, you’d better convert ISO to H.264 MKV/MP4 for Plex and Apple TV compatible format first. Well, there’s gonna be a bunch of software people will tell you about and it’s usually discovered by trial and error. My setup is all Apple so on my Mac I use Brorsoft Video Converter Ultimate to convert my dvds and Blu-ray to MKV HD format x264 and I have no issues playing any movie thru my Apple tv4. Subtitles being transcoded does not negatively impact playback unless your network bandwidth is small. Brorsoft has a lot of presets to choose from depending on clients you plan on streaming. I usually just use the Apple TV setting and the hardest part is the wait. I was never really a fan of handbrake thought it took too long. Brorsoft has quick conversion on most files. Whatever server you decide to build and go with just make sure you give it some processor power and you won’t have to worry so much about transcoding issues. The equivalent Mac version is Brorsoft iMedia Converter for Mac, which can rip and convert any video files to Plex Media Sever H.264 MKV format for playing on Apple TV 4 on Mac OS X (macOS Sierra included). Run the ISO to Plex Converter and click “Load DVD” to select and load the ISO image files to the program. Or drag any video files to the software interface to import the file. You can add several videos for converting at one time as this video converter supports batch conversion. Click Format bar and select output format. 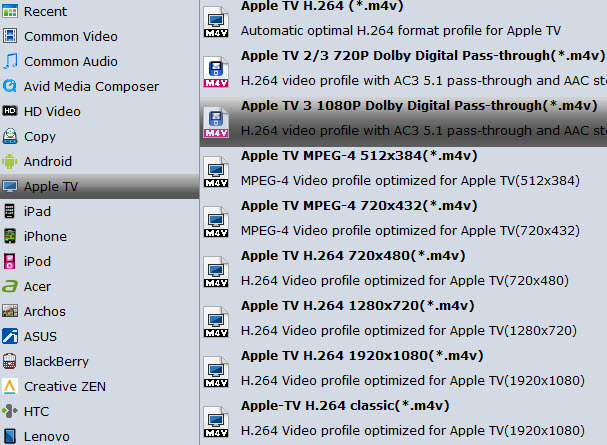 To convert ISO to H.264 in MKV quality, you can select “Common Video”. Plus, if you wanna play the output videos on certain devices, a better choice is selecting the preset for device as the output format in the output box. Note: Plex just plays the MP4/MKV files with H.264 video codec and AAC audio, you need to click the Settings icon to set the correct video, audio codecs. Of course, the program has a number of presets for Apple TV, Apple TV 2, and Apple TV 3rd Generation. Here “Apple TV 3 1080p Dolby Digital Pass-through (*.m4v)” preset is recommended for Apple TV 4. Get the output h.264 MKV video files or M4V files for transferring to Apple TV 4 via Plex from Mac. In this way, you can play ISO files with Plex on Apple TV 4 without problems. Very easy to use, lots of features included and not over priced.